Most of the times when working with my audience i got some similar question around Graphical Processing Unit's.Where in they are really keen to understand the Capabilities of vGPU's. So thought of answering the question and dedicated this article wherein will understand the capabilities of vGPU's. NVIDIA GRID vGPU enables Virtual Machines to have Direct Access Simultaneously to underlying Physical GPU. NVIDIA GRID vGPU software when combined with NVIDIA GRID cards offers a platform that delivers GPU hardware acceleration shared between multiple virtual desktops. Below mentioned are the available software editions for NVIDIA GRID vGPU available in different forms like Perpetual License, Concurrent users, Annual Subscription. Ideal for users who want a virtual desktop but need great user experience leveraging PC Windows applications, browsers and high definition video. GRID Virtual PC delivers a native experience to users in a virtual environment,allowing them to run all of their PC applications at full performance. Ideal for mainstream and high-end designers who use powerful 3D content creation applications like Dassault’s CATIA (Delivers 3DEXPERIENCE platform, delivers CATIA’s Design, Engineering and Systems Engineering applications), SOLIDWORKS,(is a solid modeling computer-aided design (CAD) and computer-aided engineering (CAE) computer program) and 3DExcite,Siemens NX, PTC Creo, Schlumberger Petrel, or Autodesk Maya. users to access any Windows application at full performance on any device, anywhere. 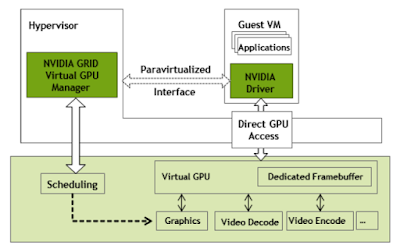 When working with NVIDIA GRID vGPU sharing is accomplished based on different GPU profiles each enable a dedicated amount of video memory suitable for different use cases similar to physical graphics adapters. For example Grid K1 (K180Q) has Graphics memory of 4GB with 4 Maximum Displays per users and 4 Maximum users per Graphic Board is suitable for Entry level Designer whereas GRID K2 (K280Q) has Graphics memory of 4GB with 4 Maximum Displays per users and 2 Maximum users per Graphic Board. This is made possible with the help of NVIDIA Grid vGPU Manager which enable the selection and management of GPU profiles assigned to each user based on the available physical GRID graphics adapter. Few Prerequisites we need to take care before proceeding further with the installation in our vSphere Environment. NVIDIA GRID K1,K2, or Tesla M60, M10, M6 cards. A server platform capable of hosting (ESXi) and the NVIDIA GRID or Tesla cards. The NVIDIA GRID vGPU software package for VMware vSphere, consisting ofthe GRID Virtual GPU Manager for ESXi, and NVIDIA GRID vGPU drivers forWindows, 32- and 64-bit. VMware vSphere 6 or later. 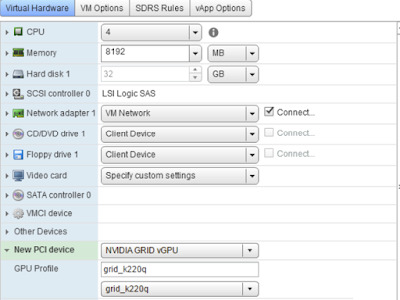 For VMware Horizon with virtual machines running NVIDIA Virtual GPU, we will also need VMware Horizon 6.1 or later. vGPU Manager is available in the form of VIB's for our vSphere environment and the installation follows by connecting to our ESXI's host through command line and proceeding further with the installation using ESXCLI command (esxcli software vib install). * Before proceeding further with the installation of VIB's ensure ESXi host is in Maintenance mode and all the VM's are either Migrated to a different ESXi host or are Powered OFF. 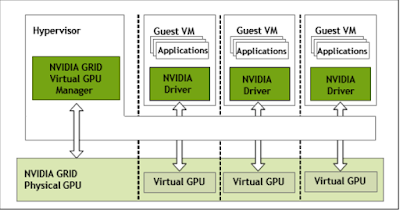 GRID vGPU assigned to Virtual Machines are similar to physical GPU because each vGPU has a fixed amount of Frame Buffer (Portion of RAM containing a bitmap that is used to refresh a video display from a memory buffer) which is allocated at the time when vGPU's are created. graphics (3D), video decode, and video encode engines. After the successful installation of VIB's and using the supported cards we can verify the installation by using NVIDIA-SMI (System Management Interface) which helps in reporting the management information about the Physical GPU and the vGPU system currently there. physical and vGPU but it can also help us to monitor the performance of both Physical and vGPU. Depending on which Virtual Machine we want to configure to use vGPU we can edit the settings of that VM and can select the new device (Shared PCI Device). * Another Important point that we need to take care is to ensure that the memory reservation for our Virtual machines should be equal to their allocation in another words ensure that we are reserving the entire available memory for that Virtual Machine. Once we have configured the required settings for our Virtual Machine it's time to Power on the Virtual Machine and check the details on NVIDIA Control Panel to have a look on the vGPU the Virtual Machine is using and its capabilities. 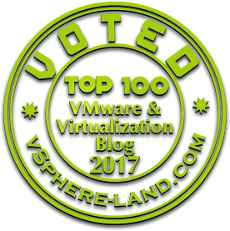 Will be writing more articles related to vGPU series talking about the various NVIDIA GRID Cards and their functionalities with respect to VMware vSphere Enviornment and Horizon Environment.